Among the four witnesses were three Lebanese – Goshen Joseph; Joseph Mechleb and Maroun Mechleb – who are working in Nigeria as building and construction engineers. Mechleb, who was fielded as PW10, is the Chief Executive Officer of a construction firm, Samchase Nigeria Limited, which is based in Akure, the Ondo State capital. While being led in evidence by the prosecuting counsel for the Economic and Financial Crimes Commission, Mr Rotimi Jacobs (SAN), Mechleb told the court that he had done various jobs for both the Federal Government and some states, including Ekiti State. He said he did jobs for Ekiti State in 2006, 2014, 2015 and 2016 when Fayose was governor of the state. Mechleb told the court that the jobs he did for Ekiti State were facilitated by Abiodun Agbele – an aide to Fayose. He said there was an agreement that he would “appreciate” Agbele for every contract he facilitated for Samchase Nigeria Limited. Mechleb said though the “appreciation” was not specified, it was usually about 10 per cent of the contract sum. The Lebanese, who told the court that he could neither write nor read English language, said the scope of the contracts was usually communicated verbally, saying, “We agreed that when he got jobs for me, I will appreciate him. “We did not specify but it’s around 10 per cent.” Mechleb told the court that he once lied to the EFCC about owning a property on Agbele’s instructions. He said he falsely claimed ownership of the property in order to help Agbele, whom he described as a friend. The Lebanese had been asked by Jacobs if knew of a company, JJ Technical Services Limited, to which he replied that the firm belongs to his younger brother and brother-in-law, Maroun Mechleb and Joseph Mechleb, respectively. He said his brother once approached him to help get some jobs for JJ Technical Services Limited, because since the company was incorporated in 2007, it never got any job. Mechleb said he collected the firm’s documents and gave to Agbele to find job for it, but Agbele did not. The Lebanese said at a time Agbele approached him and asked if he had a company which could be used to get a contract. He said he then nominated JJ Technical Services Limited. The Lebanese said Agbele later bought a property in the name of JJ Technical Services Limited and brought the deed of assignment for him to sign. Mechleb said he signed the document not knowing that it was in respect of a property. “At the beginning, I didn’t know it was document of a property but I later got to know when the EFCC invited me and I had to contact Mr Abiodun Agbele,” Mechleb said. The Lebanese said Agbele instructed him to tell the EFCC that he own the property, which he said he told the EFCC while dictating his statement on July 28, 2016. He said when he left the interrogation room, he told his lawyer who was with him that what he told the EFCC was not the truth, rather it was what Agbele instructed him to tell the anti-graft agency. Mechleb said his lawyer was angry with him and told him to go back and tell the anti-graft agency the truth. He said he went back immediately and dictated a second statement in which he denied ownership of the property in question. During cross-examination, the second defence counsel, Mr Olalekan Ojo (SAN), asked Mechleb, “As an adult, will you tell a lie, if you are told to lie?” Responding, the Lebanese said, “In the first statement, I didn’t say the truth because of the relationship between me and the person (Agbele).” “As a Christian, if you are told not to say the truth, you will not say the truth?” Ojo asked. “I was trying to help a friend. I lied to help a friend at the time. But when the lawyer asked me, I went back to say the truth based on my conscience.” Earlier, Goshen Joseph and Joseph Mechleb, who testified as PW8 and PW9, respectively, had denied knowledge of the property bought in the name of their company. Justice Mojisola Olatoregun adjourned further proceedings till April 15. 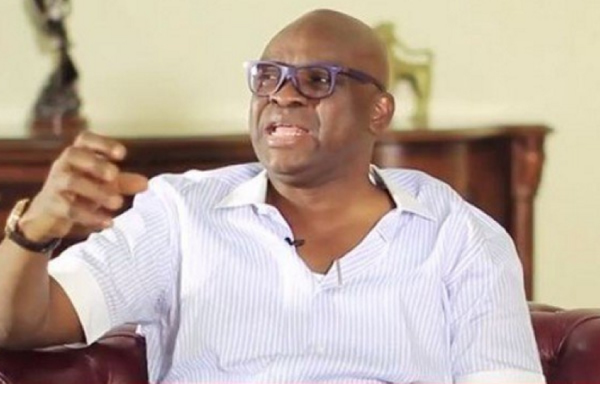 In the charges against him, the EFCC, among other things, alleged that on June 17, 2014 Fayose “took possession of the sum of N1, 219, 000,000 to fund your 2014 gubernatorial campaign in Ekiti State, which you reasonably ought to have known formed part of the proceeds of an unlawful act, to wit: criminal breach of trust/stealing.” YOU MAY ALSO LIKE: My absence from Senate denied Kogi oil producing status – ex-Air chief He was also alleged to have on the same day “received a cash payment of $5,000,000 from Senator Musiliu Obanikoro, the then Minister of State for Defence, which sum exceeded the amount authorised by law and you thereby committed an offence contrary to sections 1 and 16(d) of the Money Laundering (Prohibition) Act, 2011 (as amended) and punishable under Section 16 (2)(b) of the same Act.” But the governor, alongside his co-defendant, Spotless Limited, has pleaded not guilty.